Since the economic crisis in 2001-2002, Argentina has made a lot of progress but it still faces considerable challenges as a result of income and regional poverty. This can be seen in the neighbourhoods we work with; communities with problems such as marginalisation, drug use, lack of education and general lack of support for children. As a group you will provide what the staff in the organisations we work with rarely get the chance to provide; that added extra element of individual care and attention that every child needs. 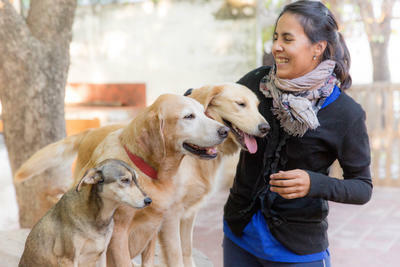 Groups volunteering with children in Argentina will be based on a number of placements in Cordoba, Argentina’s second largest city, and the surrounding area. 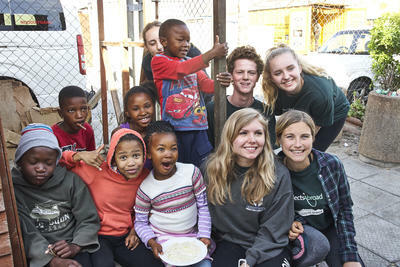 Projects Abroad works mainly with community centres, kindergartens and dining halls, which will require volunteer groups to be very hands on, helping with the everyday care of up to about 20 children. At these placements, groups are given the opportunity to develop their own activities to engage, entertain and teach the children. We also work with a number of centres for disabled people and others with special-needs. If your group have a love of horses then you could even combine this with a caring role on our Equine Therapy project. When you apply, please let us know where you feel your group would best be able to help and our staff will work with you to find a suitable placement. We have a variety of classes and workshops that groups can get involved in which focus on music, pottery or painting with a group of children. At the end of the day the older children will probably need help with their homework. If your group have experience then it is possible to also get involved with physiotherapy sessions at some of the placements with disabled children. Depending on the age-group and needs of those that your group are working with, you are likely to be asked to help with a wide range of activities. Your group may be required to help the staff with basic care duties at certain times of the day, but there will be other times when the work is less structured and you can all help by simply playing with the children. Whatever skills and talents your group has individually or shares, Argentina will give you the opportunity to put them to good use. Teach the children to dance, draw or play football with them, your group could even arrange to take the children on a day trip. The more time and effort you put in, the more rewarding your placement will be, both for the children you are working with and for you yourself.